Find out who will win today? In Today’s Dream11 Fantasy Cricket Prediction RCB vs RR 53rd T20 Match IPL 2018, we will cover likely playing 11, toss prediction, and pitch report of Sawai Mansingh Stadium, Jaipur. We will also cover players recent and past performance, all the latest news and details of Rajasthan Royals and Royal Challengers Bangalore, dream11 guru prediction, weather report of Jaipur, key players, the best choice for captain and vice-captain, dream 11 best teams, where to watch the live match of RR vs RCB and details of live streaming. All the details in this post are taken from very reliable sources. Make sure to read the complete post to get 100% benefit. Each and every section of the post has some tips and tricks for fantasy leagues. Read each section to win in grand leagues. You can only win in any fantasy leagues if you have the above details. Try to read all the sections and make your perfect teams. Where Can You Watch the Live Streaming of RCB vs RR or Channels to Watch? Who Will Win the 53rd Match of IPL 2018 Between RCB vs RR and Toss Prediction? What is the best combination of players for Dream11 in 53rd Match? Date: The match will be played on 19th May 2018 (Saturday. 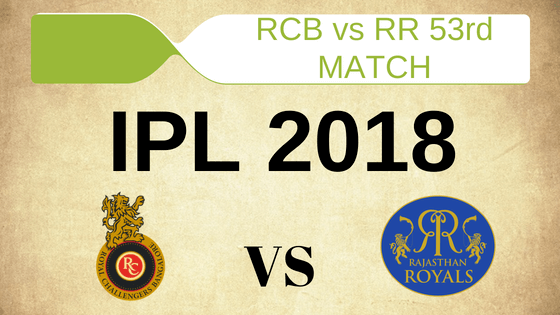 Match: Indian Premier League, RR vs RCB, IPL 2018. The pitch of Jaipur, Sawai Mansingh Stadium is difficult to bat on. It has got a two-paced bounce and the ground is very big to hit the ball out of the park. The bowlers will enjoy bowling on this ground. In the last six matches played on this ground, the seamers took 31 wickets and the spinners took 22 wickets. The spinners have to bowl in the good length to take wickets. On 19th May, it will be a sunny day in the morning but in afternoon there will be some clouds and it will be there throughout the day. There is no sign of rain and the fantasy users and cricket fans can enjoy the complete game. The temperature is expected to be 40-Degree Celsius and the humidity to be 12%, which may rise up to 20%. In last five matches, RR has won two matches out of five matches and RCB has won two games out of five games, One match was a tie. In overall encounters, RAJ won 8 matches and BLR won 8 matches. At this venue, Rajasthan Royals won two games and Royal Challengers Bangalore won three games. Star Sports has paid a huge amount of INR 16,347.50 Crores to get exclusive rights of IPL 2018 for live coverage for five years starting from 2018 to 2022. Star Sports has all the media rights including TV and all Digital Rights. You can watch the full match of Rajasthan Royals vs Royal Challengers Bangalore, 53rd match on Star Sports. In this section, we will provide you with the squad of Royal Challengers Bangalore vs Rajasthan Royals. Virat Kohli (c), Parthiv Patel (wk), Pawan Negi, AB de Villiers, Moeen Ali, Kulwant Khejroliya, Pavan Deshpande, Colin de Grandhomme, Chris Woakes, Mandeep Singh, Corey Anderson, Sarfaraz Khan, Aniket Choudhary, Tim Southee, Yuzvendra Chahal, Washington Sundar, Umesh Yadav, Brendon McCullum, Mohammed Siraj, Navdeep Saini, Quinton de Kock, Aniruddha Joshi, Murugan Ashwin, Manan Vohra. Heinrich Klaasen (wk), Jaydev Unadkat, Ajinkya Rahane (c), Mahipal Lomror, Rahul Tripathi, D Arcy Short, Dushmantha Chameera, Ben Laughlin, Sanju Samson, Shreyas Gopal, Sudhesan Midhun, Stuart Binny, Ish Sodhi, Krishnappa Gowtham, Prashant Chopra, Anureet Singh, Ankit Sharma, Jofra Archer, Jatin Saxena, Aryaman Birla, Dhawal Kulkarni. The team winning the match will have a better chance of qualifying for the playoff. Both the teams are with 12 points. RR has lost their last game against KKR. On the other hand, RCB has won back to back matches. It will be interesting to see how both the teams make their playing 11 combinations. We will give you the probable playing 11 in the next section. Royal Challengers Bangalore has won back to back games and they will try to continue this in today’s match also. RCB will definitely don’t want to lose the winning momentum and break the winning combination. Kohli will play with the same playing 11 until and unless there is any fitness issue. Virat Kohli (capt), Moeen Ali, Mandeep Singh, Tim Southee, Mohammed Siraj, Parthiv Patel (wk), Colin de Grandhomme, Sarfaraz Khan, Umesh Yadav, Yuzvendra Chahal, AB de Villiers. Rajasthan Royals have to make force change as their main players have left to their country for national duty. D’Arcy Short and Heinrich Klaasen may replace Jos Butler and Ben Stokes. Dhawal Kulkarni may get a chance in place of Anureet Singh. Except for these changes RR will go with the same team. D’Arcy Short, Sanju Samson, Stuart Binny, Jaydev Unadkat, Jofra Archer, Rahul Tripathi, Ajinkya Rahane (c), Heinrich Klaasen, K Gowtham, Ish Sodhi, Anureet Singh/Dhawal Kulkarni. Pro tips: Both the wicket-keepers are good. You can take Sanju Samson over Parthiv Patel. Make a combination of the above players for multiple teams. Pro tips: The above players are most likely to score. Make a combination of the above players for multiple teams. Pro tips: The above bowlers are most likely to take a wicket in today’s match. Make a combination of the above players. If Rajasthan Royals want to go to the playoffs, they have to win this match by a big margin. On the other hand, Royal Challengers Bangalore can go to the playoffs if they win the match. Both the teams will give their 100% to win the match. On paper, RCB seems a strong team as compared to RR. According to our astrology prediction, BLR will win the match. The team winning the toss should bat first as batting first will have less pressure and the pitch will become difficult to bat in the latter half of the game. According to our astrology prediction, RCB will win the toss and they will ask RR to bowl first. AB de Villiers has an outstanding record against RR. He has scored 505 runs at an average of 45.91 in last 14 innings. Ajinkya Rahane also has a good record against RCB. Samson has performed and scored runs against RCB in the previous game. Ish Sodhi and Yuzvendra Chahal will play a key role. Conclusion: This is it for Today’s Dream11 Fantasy Cricket Match Prediction of RCB vs RR, 53rd T20 Match, IPL 2018 which will be played on Saturday 19th May. You can give your valuable feedback in the comment section. Subscribe to our notification of latest updates. GOODBYE!